Today’s CIO needs to do much more than make sure the infrastructure is solid. You also need to work with curriculum and instructional leaders to be sure your students have the skills and experience to take on whatever they choose. For many, that means turning an outdated room into something more useful. But where do you start? Here’s how three technology leaders handled their renovations. They spoke with students, parents, and teachers to ensure stakeholder buy-in, and then they began looking into funding options, including district funds, grants, Title I money, and fundraising. They used technology funding for the technology, building and grounds money for lighting and flooring, and fundraising (through their foundation) for furniture. “We developed a systemic approach so that we can continue to fund more renovations,” says Taylor. ■ Get creative about funding. Look for alternative bids. “We found a local cabinetmaker to do something that cost four times less than the furniture company,” says Taylor. ■ Try to make partnerships with vendors. “If you’re looking for the best deal you don’t get far. Instead, offer to help improve their products and services in exchange for them giving you ideas that meet your needs.” Taylor worked with Phi Services to connect each side of the Nureva Span visual collaboration system with additional boards on both sides, thus making a two-sided interactive surface with 20 feet of continuous display. “It is like nothing I have seen before; students can walk around or work on either side independently,” says Taylor. At the beginning of the 2015–16 school year, Des Moines (IA) Public Schools had some STEM and grant funds, so they decided to turn three classrooms at Hoover High School into an innovative, student-centered space. Maureen Griffin, the director of Hoover’s STEM Academy, spoke with vendors and quickly discovered that her funding would not cover the project. Luckily, her superintendent offered to match her funding. 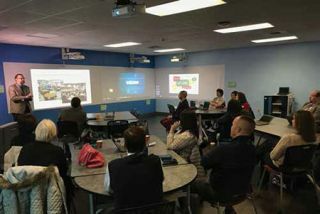 “Maureen wanted to use technology to reinforce collaboration and create a space that would accommodate different types of learning, including personalized learning, small groups, and large groups,” says Dan Warren, director of technology operations, central stores, and printing services. Today, the STEM Academy has an Epson projector in one area, a pod with a monitor that holds up to six people and their laptops, a couch, and a whiteboard area. “It’s a cool and inviting space that teachers are using for STEM, Project Lead the Way, and lots of other projects,” says Warren. The school took an older, brick-and-concrete middle-school building and knocked down a tremendous number of walls. They put in light-colored, movable furniture that can be reshaped for whatever the classroom needs. A few of the classrooms were opened up and have a variety of desk configurations; some are traditional; others have odd-shaped tables that can be spread out or put together. “The children can lift and move everything,” says Haberstroh. “A couple of rooms have beanbag chairs for reading circle and there are quiet corners all over the building.” There are tables with dry-erase surfaces for students to write on. Best of all, there are no teachers’ desks because teachers are out and about with the students. Middle school students get to take a 3D printing and modeling course in the makerspace that Haberstroh developed. They learn how to use Autodesk’s Fusion 360 and then print their designs with the 3D printer. Within two classes, students designed and printed an earbud holder.